Lobongo Lotika is a traditional Bengali Sweet. This sweet is made in two part. The first part is to make the Coconut stuffing and the second part is to make the body. Then the stuffing is inserted inside the body, and wrap the body like a parcel. And secure the parcel from opening with the star ingredint Lobongo (Clove). That is why the sweet is called as "Lobongo Lotika". And after that deep fry the stuffed parcels and soaked into sugar syrup. This sweet can be stored for a long time. So my gradmom used to make this sweet for our long trips. 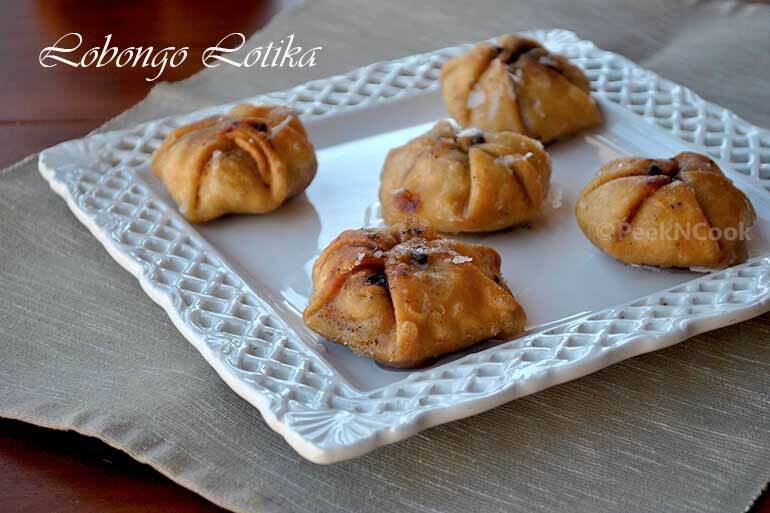 Lobongo Lotika is a traditional Bengali Sweet. This sweet can be stored for a long time. Take a bowl and add Maida, Salt, Sugar, Baking Powder & Ghee and mix them together. Now add warm water little by little to make a firm dough. When the dough will be ready kneed the dough well and aplly some oil in your hand and rub on the dough and cover it and keep aside. In a pan add all the ingredients under heading of Stuffing and mix them together with a spoon. Turn on the heat and put the pan on the heat. Cook the Coconut mixture on medium heat, stirring constantly to prevent burning at the bottom. At first coconut will release lots of water, slowly eveporate the water and make a soft but not watery mixture by stirring constantly. Turn off the mixture and let the mixture cool down. Now make small balls from the Maida dough, roll each dough in a small circle, place 1 tablespoon of the stuffing at the center of the circle and apply little water at the edge of the circle. Now take the edges and bring to the center just like the picture and pic the with a Clove/Lobongo to secure the stuffing. Make rest of the Lobongo Lotikas just like this one. All the Lobongo Lotikas will look like a small flower. Now make the Syrup. Take a pan, add sugar, water crashed cardamom and mix them all together and stir till the sugar dissolves. Now put the pan on medium heat and bring the syrup to a nice boil. Boil the syrup for 10 minutes to make it sticky. Heat enough Vegetable oil in a deep frying pan on medium heat. the oil should not be smokey. Add 3-4 Lobongo Lotika at a time, fry them on low heat to make them crispy. When the Lobongo Lotikas will be golden in color take them out from the pan and add to the syrup. In this way make the rest of the Lobongo Lotika. After 10 minutes of adding the Lobongo Lotika to syrup, remove them and keep aside. Let Lobongo Lotikas to be cool.